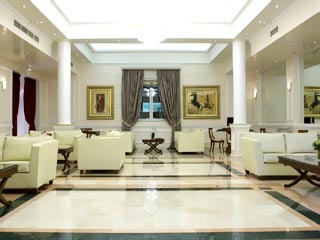 A legend renewed and revitalized, Theoxenia Palace is the incomparable star of Kifissia. The crown jewel of Kefalari Square, it presides with grace and glamour. And now, completely renovated, this landmark structure is once again, as it was always meant to be, the premier hotel of the Northern Suburbs of Athens. Whether your visit entails business or is purely pleasure, a stay here assures you the ultimate in gracious luxury, attentive personal service and the pleasures of an incomparably magnificent and convenient location. And now, as of August 2004, Theoxenia Palace is proud to present its newest addition : Theoxenia House Hotel. Located in the most enviable location in the exclusive suburb of Kifissia, and built to the highest standards of quality and luxury, this distinctive hotel was created as an extension to the existing hotel and is completely focused on your needs and desires. At Theoxenia Palace personal satisfaction and relaxation is a priority. 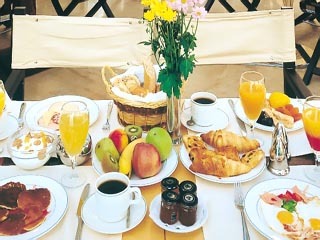 The guests can start their day by enjoying a rich breakfast buffet. 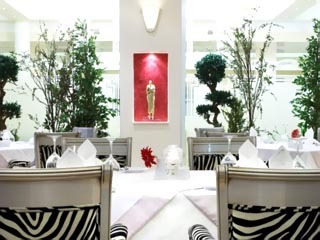 Dinning at the hotel's Zebra lounge & restaurant is a unique experience which combines an elegant ambience with impeccable service and great attention to detail. Decorated in tones of pale yellow, grey and gold, Zebra lounge offers a great selection of tastes served daily for lunch and dinner The uncrowded, romantic atmosphere is perfect for a leisurely dinner or late night supper. 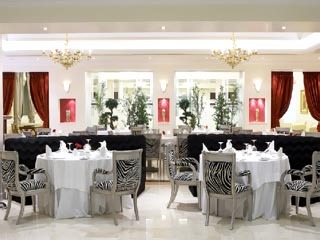 The Zebra Square lounge maintains the Theoxenia Palace tradition of elegance with daily afternoon tea and light music. A bistro-style lunch is served, as well as light fare and cocktails throughout the day. The Zebra Square lounge is ideal for cocktails or desserts, during the day or in the afternoon . This casual, inviting room offers a relaxing environment and makes it the perfect meeting place for business individuals. The mood of casual elegance is accompanied throughout the evenings by light music. 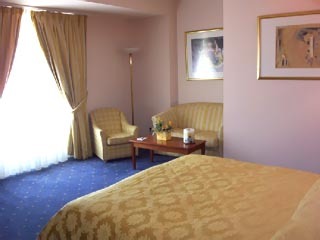 The unique advantage of the Theoxenia Palace guest rooms is the excellent view of the Kefalari Square, a distinctive element of the hotel's identity. The decoration of the rooms is modern with fine furniture, especially tasteful color combinations, and is characterized by subtle luxury. Single Room The single rooms with view to the hotel pool are nicely furnished in order to provide the most comfortable accomodation to hotel guests. 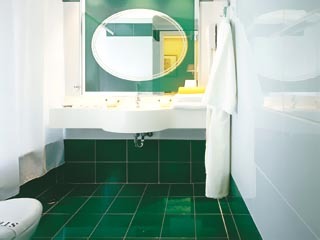 These rooms are best suited for business people who require privacy and a quite stay to relax from their busy schedule. Guest Room The standard guest rooms are exquisitely furnished and convey a feeling of comfort elegance and luxury. These comfortably appointed Guest Rooms include a sitting area and large windows offering views of the Kefalari park and the pool area. 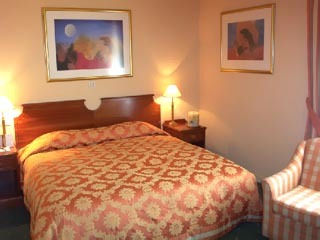 Rooms for non-smokers are available on request, as are wheelchair-accessible rooms. Superior Room The Superior rooms with view to the park are larger and are ideal for people conducting business, since they have study desks. Superior rooms are characterized by thoughtful amenities and a unique sense of comfort and style that even the most discerning of guests will appreciate. Deluxe Room The Deluxe rooms are located at our executive floor and are very detail oriented rooms, ideal for high-ranked executives. These rooms feature a spacious balcony at the top floor of the hotel, offering spectacular views of Kefalari and the surrounding area. 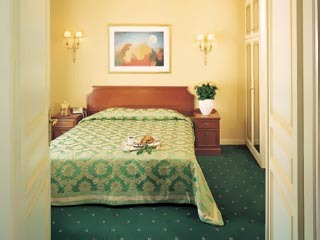 Suites The Suites at Theoxenia Palace are designed to surpass every expectation. The Executive Suites are located at the top floor with access to a private terrace each. Panoramic views stretch out in all directions, encompassing the Kefalari Park, Mount Penteli and the distinctive skyline of the City of Athens. All Suites include a parlor, conveniently separated and ideal for informal meetings or entertainment. Junior Suites The Junior Suites with view to the pool offer a larger living and dining area. They feature a dinner table and a separate desk, ideal for business people working from their suite. These suites convey a sense of tranquillity of the view of the hotel pool. 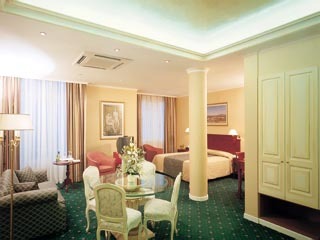 Executive Suites The Executive Suites are among the best suites in Athens. 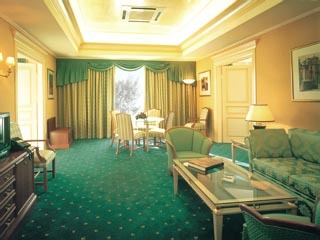 The Hotel's most luxurious quarters, the Executive Suites, feature spacious rooms for entertaining, work or relaxation. With a size of 95 m², each Executive Suite offers a luxurious, residential feel and a private location on the top floor of the Hotel. Windows admit plentiful natural light and sweeping, panoramic views of both Kefalari park and the distant city center. Each of these suites has two separate bedrooms, featuring two bathrooms, one with a Jacuzzi, a study desk and a large conference table. Additional features include a large 29-inch color TV, CD stereo system, and a spacious veranda surrounding each suite. 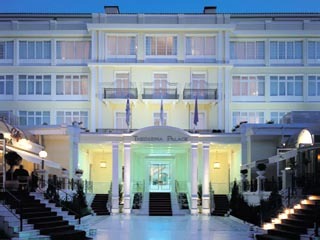 The Theoxenia Palace Hotel is located in Kefalari Square, in Kifissia, one of the most exclusive suburbs of Athens. It takes only a five minute walk from the Hotel to the Shopping Centre of Kifissia and ten minutes to the railway station linking the suburb to the Centre of Athens and Piraeus. Open All Year... 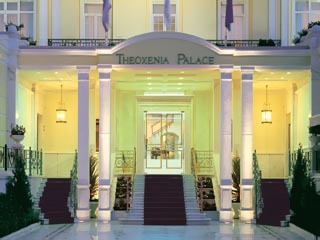 The Theoxenia Palace Hotel is located in Kefalari Square, in Kifissia, one of the most exclusive suburbs of Athens. 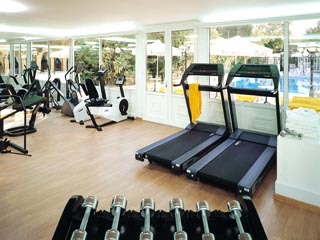 The Theoxenia House is 80 meters away from Theoxenia Palace Hotel.